R.H.I. stands for the Renewable Heat Incentive, which is a government funded scheme to encourage the take up of renewable technologies, it is the first of its kind in the world. It pays both domestic users and businesses to heat their properties by green energy. We are able to give up to date guidance and latest information on the Renewable Heat Incentive, as well as expert assistance and advice on your installation. The second phase of the R.H.I. is going to be launched in Spring of 2014. The aim of the scheme is to support households to move away from using fossil fuels for heating and to contribute to the UK’s target on renewable energy deployment by 2020. The reason for the launch of the domestic R.H.I. is to provide help for people who want to replace their current fossil fuel boiler with a greener alternative. The proposal is that the government will pay householders a tariff for every KWh of heat generated by a supported technology including wood biomass. Any consumer who is looking to replace their current technology, or has installed this kind of technology since 15th July 2009 that is MCS certified, and meets the required standards is eligible for consideration for R.H.I. Householders need to have installed thermal energy measures identified as “green ticks” through the Green Deal assessment process. 2) Paid over 7 years, although the payments will be based on the (deemed) heat generated over 20 years. This is being referred to as “20-in-7 payments”. We can help by designing, supplying and installing the highest quality biomass equipment that is designed to last far beyond the duration of the scheme. The range of biomass boilers we work with are clean, quiet, very efficient, and simple to use. Wood biomass is substantially cheaper than oil or L.P.G. and so by installing one of our biomass boilers you’ll reduce your carbon footprint and save on your fuel bill. Whilst wood log is the cheapest form of biomass heating. Wood Chip and wood pellet offer automatic feeding of the fuel whilst still resulting in significant savings on fuel. When it comes to using biomass to provide heat and hot water for the home, the fuel source is frequently wood as logs or pellets. The biomass cycle has taken carbon from the atmosphere as the trees grew and releases it when they are burned. If the trees used for biomass are replanted, the systems stays in balance. Whilst biomass boilers are typically larger than normal domestic boilers, and ideally have to be in a room in your house, or a shed, garage, or outhouse with space for the wood fuel storage. If you act now, you could be taking advantage of a massive government scheme that will leave you with some seriously hot savings. How much could I save per year installing a biomass boiler? Wood Log is the simplest form of biomass produced from felled trees. As with all biomass wood the important thing is the moisture content. Logs must be stored until the moisture is suitable for your boiler, somewhere around 20%. To get to this stage the logs need to be stored for at least 1 year, with air circulating round them and shielded from the rain. Wood Pellets are usually no more than 15mm long. They are made from processed sawdust and wood chips that have been dried and made into pellets. When heated and exposed to high pressure, lignin, the binding component in wood, softens and allows the wood product to be shaped easily. Wood Chip is made from waste wood and sustainable virgin timber. For high efficiency, wood chip needs to be consistent in size and stored in a covered area that allows air to circulate so that the chip can dry naturally. 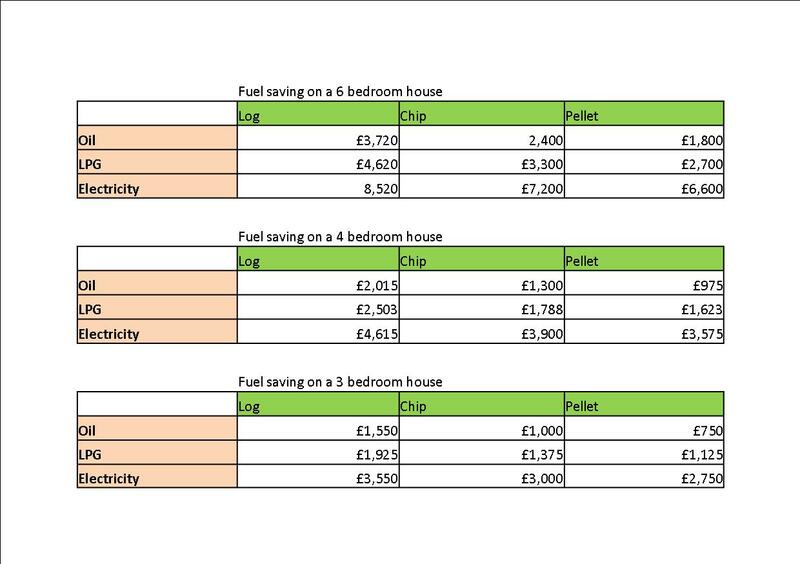 The information in the tables below is taken from the guide to the Renewable Heat Incentive.